In 1920s France, cabaret was developed as a forum for a variety of entertainment acts under one roof. Comedians, singers, dancers, actors -- all found a home in these smoky Parisian nightclubs. Fast-forward to modern day Poland, and this spirit of variety lives on in CABARET. But this CABARET isn't a downtown hotspot -- it's a band showcasing the various musical aspirations of Jarek and Michal. The music of CABARET draws comparisons to everything from Underworld to Depeche Mode to Kraftwerk; however, this duo is not looking to repeat the past, remaining adamant in creating their own sound. And there's perhaps nothing more unique in the electronic community than a band that writes their songs not on their laptops, but on the same instruments any garage band might use. "All of our demos we record with guitar or piano with vocal. And then we work with synthesizers, samplers, sequencers," says Michal. The development of this music involves a blend of its creators' abilities. "We created own style of doing music and it looks like this," says Jarek. "I am recording simply demo with chords, vocal line and some major instrumental lines. Than I am sending it to Michal and he is doing basic electro frame." Though this process clearly creates a dependence upon each other, CABARET's members actually live rather far apart. Neither sees this as a hindrance to the band's progress, however; in fact, they think it may be a help in the long run. Says Jarek, "I think it is very good situation that we live in different towns. In this way we are not tired of each other, and we feel this special kind of desire of teamwork. Look how many bands split out cause people were tired of each other." While absence may make the heart grow fonder, togetherness is a necessity when it comes to touring. Thus, the duo will be seeing a lot more of each other when they hit the road in 2006 to support their latest effort, "Homophobia." 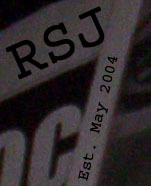 Though the album was released in October, the band decided to push the tour until next year in order to plan more fully. "We want to prepare nice show with great music and some visual effects," says Michal. "We want to give people more, want to give people what they deserve, really. They pay for tickets, so [audience members] have a right to expect more than two guys with keyboards on stage." Jarek has several ideas for the ideal CABARET performance. "We love two ideas of our live show. First one: intimate live gig in small club, only acoustic guitars and piano plus stage full of candles. Second idea: big venue, great stage with many video monitors, some extra musicians on stage." The live show isn't the only facet of CABARET its members hope to differentiate from the rest of the electronic community. In fact, despite having signed with an industrial/techno label, the band doesn't feel much affiliation at all with the synth scene. "I am not a big fan of synth-pop music," said Jarek. "If I do listen to electro music, it is rather club, chill out, ambient music: Underworld, Oszibarack, etc." 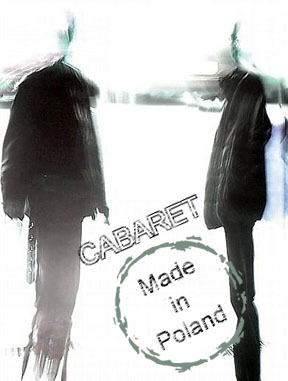 CABARET is used to standing apart from the crowd, as the band's sound is downright unheard of in their home country, which has been primarily oriented toward the pop scene. "We were a communistic State; the foreign bands could not play in Poland live. If Tangerine Dream, Depeche Mode or other bands did gig in Poland it was like great event, like dream that could come true. People were in touch only with 'made in Poland' music. This is the reason why pop music is so popular in this country," says Jarek. "When you play something different than this you always have a difficult path to walk on." A path that has become a little easier as of late, with the band beginning to receive more attention for their work. With the help of director Krzysztof Szarek, they've completed a video for "Electric Chair Song," and are currently working on the next for "Rain On My Skin." Furthermore, they've developed their own production company, Noise Gate Productions, allowing them to spend some time working with other artists. 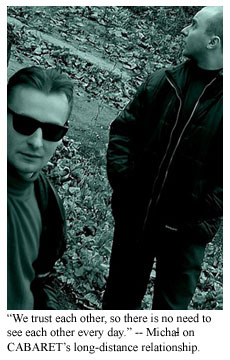 "I really enjoyed the mixing work for Priest project," says Jarek. "It is great music, and it was very nice work for me." 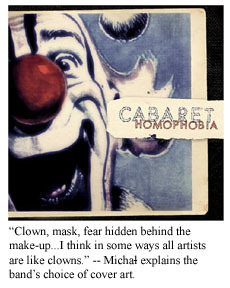 CABARET will always be their first love, however, and right now they just want to continue to do something they can call their own, regardless of how others attempt to categorize. After all, what would CABARET be without a sense of variety? "We really do not care how people call this music and what shelf they will put this CD on," says Michal. "We play what we feel, and if you call it synth pop, pop, rock, ambient, dance, electro it is always okay. Until it is interesting thing, the name is not important."